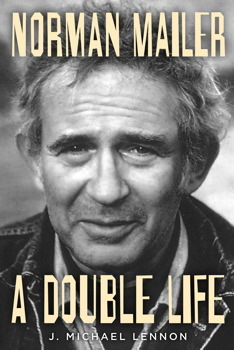 Cover of “Norman Mailer: A Double Life” by J. Michael Lennon. In January 1971, J. Michael Lennon wrote a letter of encouragement to Norman Mailer after watching the author get into a raucous televised debate with Gore Vidal. Mailer responded, sparking a lifelong correspondence between the pair. Lennon went on to become Mailer’s personal archivist and authorized biographer, as well as Emeritus Vice President and Emeritus Professor of English at Wilkes University. He has written and edited a number of books about Mailer, including Norman Mailer: Works and Days (2000). His most recent book, Norman Mailer: A Double Life, comes out today. This biography draws on unpublished documents, including Mailer’s letters, as well as Lennon’s personal relationship with the author. In 2009-2010, Lennon visited the Ransom Center on a fellowship funded by the Norman Mailer Endowed Fund to conduct research for the biography. Cultural Compass spoke with Lennon about his new book, his work in the Ransom Center’s archive, what first attracted him to Mailer’s writing, and more. You knew Mailer well before starting work on Norman Mailer: A Double Life. While researching and writing, were you ever surprised by anything you learned about him? I was surprised at the intensity of his depression after his second novel, Barbary Shore, received extremely negative reviews in 1951. He became more depressed (but not clinically) than I had previously thought and actually investigated the possibility of working in a prison or becoming a lawyer. The other things that surprised me were the extent of his many passionate love affairs and the number of young writers, hundreds of them, with whom he corresponded, and encouraged, something that went on from the 1950s until his death in 2007. I hope readers will see how immersed Mailer was in the great events and issues of the latter half of the twentieth century and the first years of the next one. He saw and wrote about World War II, the Cold War and the espionage and counter-espionage that accompanied it, the Civil Rights and Women’s Liberation movements, technology and the environmental movement, and the early space exploration effort. Mailer not only wrote about these things, he also debated them publicly on just about every major talk show in existence. He is the most important public intellectual from the literary world in my lifetime. He was also a terrific biographer and wrote memorable biographical books and essays on a score of iconic figures, from Marilyn Monroe and Madonna to JFK, Muhammad Ali, and Hemingway. Also some infamous individuals—Gary Gilmore, Lee Harvey Oswald, and Hitler. And Jesus Christ, in his 1997 novel, The Gospel According to the Son. What first drew you to Norman Mailer as an author? His daring, his edgy style, his exploration of his identity, and his self-awareness. The Mailer archive is the largest single-author collection at the Ransom Center. Have you been through every box? How do you organize and prioritize your work in the archive? Yes, I think I have handled every piece of paper in it. Building on the pioneering work of Robert F. Lucid, my mentor, my wife and I organized Mailer’s papers and then helped the Ransom Center’s staff create the Mailer finding aid. During my several visits to the Center, I used the finding aid to organize my request list so that I could spend my time reading and note-taking. The system devised by Steve Mielke and his team made my research efforts considerably easier. I am indebted to the Ransom Center for expert and thoughtful help over the past eight years.